Replacing your roofing or even doing major roof repairs can be a daunting task. It’s important that you research the options that are best for your home to ensure you get the most out of your investment. Do you already know it’s time for a new roof or are you building your home from the ground up? Give us a call. Based on your home, location, and needs we can talk to you about the many different options for roof types, installation fees, and timeline for completion. To prepare yourself for your future roof installation, put newspaper down on the floor at the locations of any vents, such as bathroom fans and stove vents. This will protect your floors from dust that may have collected in your ductwork over the years. Things don’t normally vibrate off of the walls but if you have any valuable family heirlooms you may want to remove them. Damaged flashing – in roof valleys and other points where shingles won’t funnel the water properly. If you see these metal pieces seem loose, get rusty, or go missing altogether, you will want to get the issue fixed as soon as possible. Missing or broken shingles – If your roof is missing shingles or a shingle appears torn or broken, it’s time to get a roofer over to get you an estimate. Curled or buckling shingles – This is a sign that your shingles have reached their life expectancy. Shingle granules in the gutter – While shingles are expected to lose some granules here or there, a heavy loss of granules can show that you might need to get your roof replaced. Moss or any other plants growing on your roof – These plants have root systems that dig into shingles and ruin a roof. A debris pile-up on your roof – Allowing debris to collect on your roof can make it a perfect habitat for boring beetles and other problematic critters. Interior leaks – If your roof is now leaking, it’s definitely time to give us a call. So you may not know this, but the design of a residential roofing project is going to vary greatly from the design of a commercial roofing project. Residential roofing products are usually designed for steep slope application. Products can include roofing shingles, underlayments, and accessory products. We offer many different options like tile, shingle, foam, and flat roofs. Each of these designs will come with their own individual elements required for installation and upkeep. Read more about the resident roofing system design specific to each roof type above. Thinking about going green? We like the way you think. Why continue to pay the price in higher energy and maintenance costs for that black roof on your home? White roofing is one of the fastest, easiest, least expensive, and most effective ways to reduce energy consumption. Mostly cool roofs are associated with white roofs because light colors can typically reflect more heat than dark colors. White roofing has a variety of colors and materials available. White vinyl is one of the most popular materials in Arizona for cool roofing. We can also use rubber, shingles, PVC even metal for your cool roofing projects. There are different industry standards and certification programs to evaluate the performance of energy-saving materials. You can visit the Energy Star and Cool Roofing Rating Council sites to get more information. For existing roofing, there is no need to do a complete roof replacement unless you really need to! We are able to add a solar reflective coating to your existing roof. This will help you save energy and reduce heat. If you want to get more information about white roofing services in Arizona, please contact us today! It’s time. Either something crazy happened and we need to do a full roof replacement, or the lifetime of your current roof has expired. When you know it’s time, you just know. But what if you’re unsure if it is time to repair or replace your roof? We can help. There will be different signs based on the roof type you have that will help you to determine if it’s time for a new roof. On a tile roof, you’ll know it’s time for a replacement when you start noticing multiple leaks around the house. On a shingle roof, you’ll notice granule loss over multiple areas of the roof. You may even notice you’re losing shingles on windy days. On a flat or foam roof, you’ll notice the foam exposed through the coating. If you don’t know or you’re unsure, give JBS Roofing a call so we can perform a roof inspection. We can determine if it’s time for an entirely new roof or if we just need to do a repair. If a new roof is in the cards, we’ll be happy go over the different types and quotes with you to ensure we get the right roof for you and your home. With so many roofing options available on the market today, your first question very well may be, what are the benefits of tile roofing? 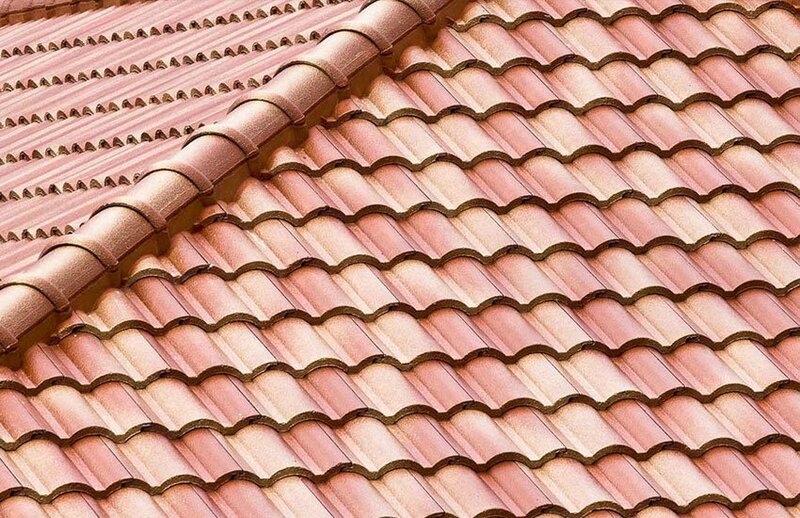 Tile roofing materials are designed for longevity and are traditionally made from materials such as concrete, clay and sand. All of which are fireproof. Tile roofs are resistant to deterioration. There are many different options in the realm of tile roofing possibilities. With clay, concrete, metal, Spanish style, and composite style tiles, we’re sure one of these options will look beautiful on your home! Tile roofing is highly customizable, requires minimal repairs over the years, creates lower energy costs, and are worth every single penny. Tile roofing complements the Arizona southwestern style and culture unlike any other roofing option. In addition to the beautiful look and style they’ll add to your home, some say that tile roofs can last for more than 50 years! Think you might be selling your home sometime in the future? Or maybe this is just your next project on your home-flipping expedition? Either way, Tile is definitely an advantage when looking to resell your home. It isn’t as important as having a nice roof in general, but having a tile roof will come to your advantage when it comes to having a home that will sell quicker and at a higher price point. What is a roof shake? A shake is typically described as a wooden shingle that is made from split logs. When these are used for covering the top of a house, the result is a shake roof. Natural wood roof shakes can be very expensive. It is hard to beat the appearance of a natural wood roof. If you are making over a traditional older house, cedar roofing is probably the historically appropriate choice. Cedar roofs require regular maintenance to prevent moss, mold and mildew growth. However, there are cedar treatment preservatives that can be added during the crafting process to prevent fungal growth and preserve the wood. the roof space to be used as a living space or a living roof. You may have noticed that flat roofs are very common amongst homes in Arizona as this option has been around for centuries. Flat roofs are impressive, cost-effective and a super durable roofing option for homeowners. In addition to those benefits, flat roofs fit into the Arizona southwestern feel very stylistically and they add value to our communities. They are incredibly easy to repair and replace. But flat roofs aren’t only just for us in the southwestern states. Flat roofs exist all over the world and each area has its own tradition or preference for materials used. You’ll find in warmer climates, where there is less rainfall and freezing is unlikely to occur, many flat roofs are simply built of masonry or concrete. This is a great material for keeping out the heat of the hot Arizona sun during those really warm summer months. When tile or shingle roofing may not be appropriate, such as on a flat roof, we offer foam roofing. What is foam roofing? The main material used in foam roofing is polyurethane. This makes foam roofing a wonderfully lightweight option that is durable and seamless. Acrylic, silicone, urethanes, and polyuria are the commonly used coatings a foam roof. 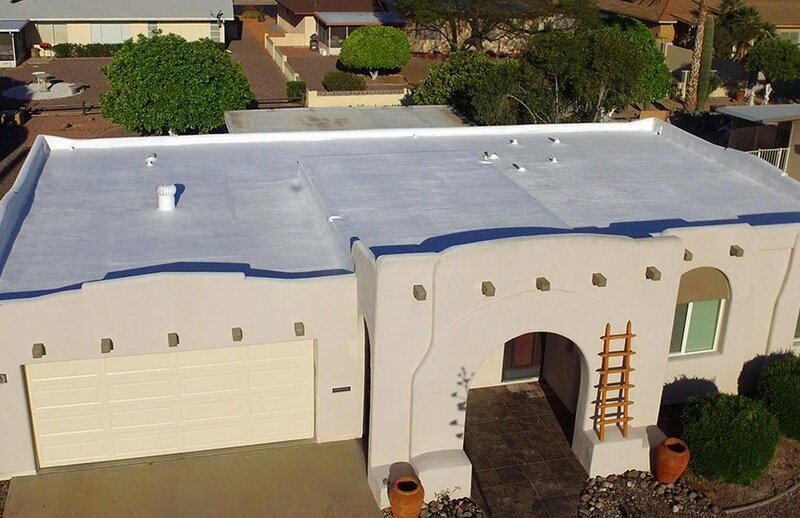 You’ll notice that foam roofing is super common across Arizona and other southern states as it is white in color and is a superior insulator to other options. So what makes a foam roof special? Foam roofs are made from eco-friendly materials. They provide incredible insolation that will keep your home cool during the hot Arizona summers. You can be positive there will be no leaks from your roof during its lifetime, it can be applied to all roof types and it has a very long lifespan. With a foam roof you can rest assured that your using the most eco-friendly option, cutting energy costs, and you very well may never have to replace this roof throughout the lifetime of your home. “All roof types are created equal” may be one of the most untrue statements when it comes to buying a new roof for your home. There are multiple different shingle options which might make it difficult to determine what will work best for you. So what is shingle roofing and how do you know if it is the right option for you and your home? Shingle roofs are a lot like tiles in that they are spread over your roof, overlapping each other to create full coverage. Shingles can be made of various materials such as wood, slate, flagstone, metal, plastic, or composite materials such as fibre cement and asphalt shingles. The two types of shingle roofing offered by JBS Roofing are asphalt shingles and polymer shingles. Asphalt roofing can be either organic or fiberglass, and either asphalt or polymer shingles are great options for your Arizona home. No matter what material shingle you choose to use, shingle roofing is relatively affordable, is easy to install, and is durable in the hot Arizona sun. Trust JBS to help you choose the right shingle roofing option for your home and we can promise you superior service and a roof that is perfect for your home. Composition shingles are one of the most affordable of all roofing types. In addition, composition shingles are very easy to replace, which can significantly cut down on repair costs. Composition shingles are highly durable. Unlike asphalt shingles, which have a much shorter lifespan (usually between 5 and 20 years at maximum), composition roofs will last up to 50 years. Composition shingles are an excellent investment in other ways, as they help shield homes from harmful UV rays, decrease energy costs and utility bill, provide a level of fire resistance, and even help prevent the growth of mold, algae, and fungus. 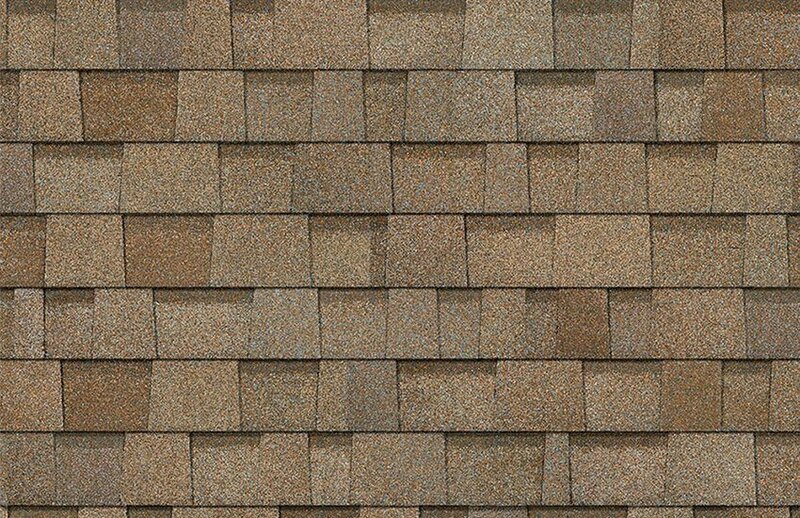 Composition shingles come in a variety of colors, textures, and styles. These days, as roofing has become more and more of a factor in developing what realtors call “curb appeal,” the look of a roof has become as most as important as it functionality. With a wide range of shingle styles to choose from than span from simple to upscale, homeowners can select the roof that will best complement the architectural style and landscape elements of their home. Asphalt shingles are the most commonly used type of shingle across North America. Today’s asphalt shingles are reinforced with a fiberglass mat or an organic material such as paper or wood fiber, and can range in life expectancy from 10 to 20 years for a typical shingle. 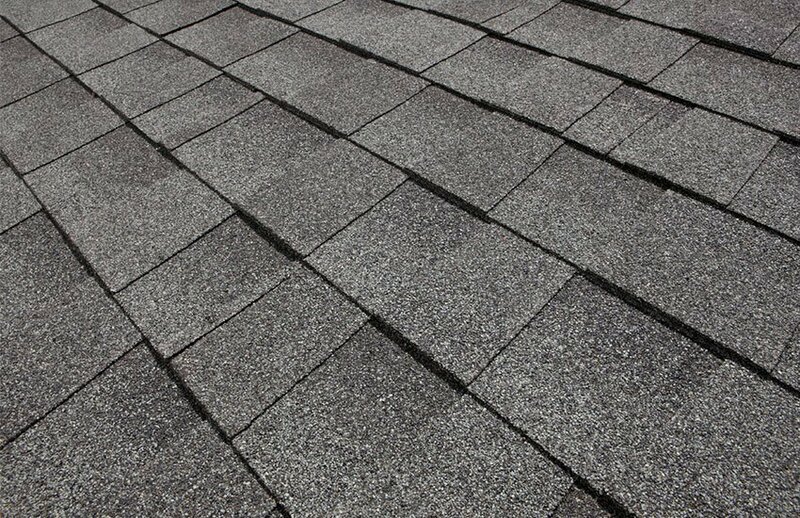 Great improvements to the asphalt shingle have been made, resulting in a more durable product know as laminated shingles. Laminate shingles are also known as “dimensional” or “architectural” shingles. Laminate shingles are also made of asphalt but differ from the “three tab” shingle in design. They were designed to add character, color and depth to the roof aesthetics. They are made of multiple staggered layers of material, with a range of durability, typically 15 to 50 years. Laminate shingles are thicker and heavier than “three tab” shingles, thus are more resistant to the elements. 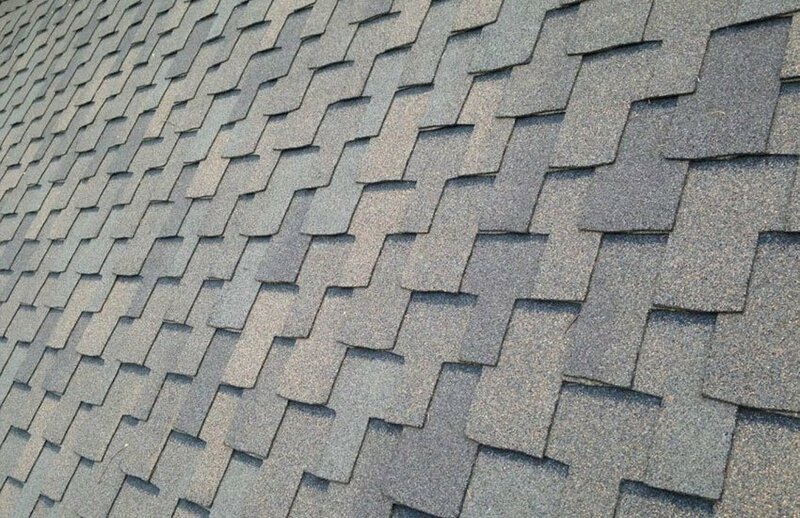 From a distance, some of the high quality laminated shingles have the look of an expensive slate or shake material, by incorporating angled or rounded tabs, shadow lines and variant color patterns. 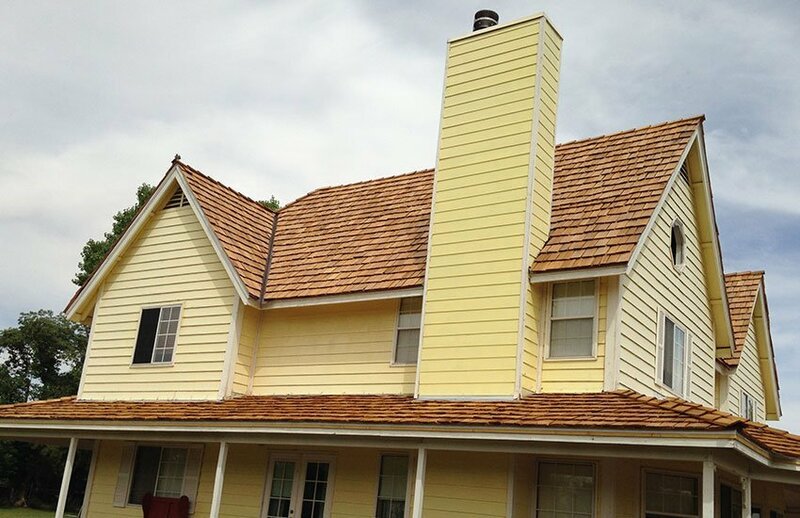 Asphalt shingles come in a variety of colors and styles. Individual shingles may be replaced if damaged. An additional advantage of asphalt shingles is that in certain circumstances, they can be installed over an existing roof of asphalt shingles, eliminating the need to remove the old roof. A great roofing project isn’t complete without a set of rain gutters! Although we might not get as much rain as they do in Seattle, it’s still very important to get your home set up with rain gutters, or get them replaced if they are damaged or old. A great roofing project isn’t complete without a set of rain gutters! Although we might not get as much rain as they do in Seattle, we can get it very heavy at times with Monsoon storms so it’s very important to get your home set up with rain gutters, or get them replaced if they are damaged or old. Even with light rain, that light rain can be seriously damaging to your home. If water is not being properly diverted away from your home, rainwater can cause wood rot and severe erosion to the ground and landscaping around your home. Wood rot is usually caused by the rain running off of a roof and down the wood fascia. Over time this will cause the wood to rot and possibly even mold. We offer a wide selection of colors to ensure our gutters compliment your home’s exterior. The experienced installers at Jim Brown and Sons Roofing have provided seamless rain gutter installation and repair services to Phoenix Valley homes and businesses since 1982. Our installers are trained and certified, ensuring a professional installation to your home or property. Please contact us for more information regarding our rain gutter installation services at 623-247-9252.
might permit moisture, heat, or pests to enter your attic. In addition, attic insulation can help to reduce energy expenses during the summer months by locking in the cool temperatures inside and resisting the heat transfer from warm air outside. it’s time to install new fiberglass insulation. Although it may not be a ‘visible’ home improvement, attic insulation is an important functional home improvement that will help you and your family stay comfortable year round, and ensure the longevity of your heating and cooling equipment. To make it even better, we’re able to install our insulation right over the existing insulation, which will save you money by not having to remove the current insulation. So what exactly is a Built Up Roof System and why should you use it for your commercial project? Built Up Roof Systems, abbreviated BUR, have been in use in the U.S. for more than 100 years. Built-up roofing is the most popular material used on low-slope roofs. It’s composed of several layers of bitumen surfaces and is finished up with an aggregate layer or coating. Built-up roofing is not really a style of roofing per say, such as a bonnet or gable roof, but instead it is a type of roofing. The name refers to the components of roofing material used. Depending on the climate and the exact materials, built-up roofing has an average life expectancy of 15 to 30 years. So why should you use BUR? Because it’s easy to clean, is incredibly cost-effective, it saves you money down the road in future energy costs, and it’s fire resistant. BUR systems can be designed and built to you and your buildings needs. They provide excellent waterproofing and ultra-violet protection. They offer superior protection against the elements in a cost effective, visually appealing way that can’t be beat. When it comes to your commercial roofing project, one of the single most important decisions will be you roof. With so many options to choose from, it’s hard to know what option is best for you and your project. Single ply roofing systems are installed in one layer, are super flexible, and they’re even more resistant to UV radiation compared to other products! To put the icing on the cake, if you choose to go for white roofing, you’ll benefit from lower energy costs in the white hot Arizona summer. Single Ply roofing membranes provide a variety of materials to choose from.Single-ply membranes can be generally categorized into two groups: Thermosets and Thermoplastics. So what’s the difference? Thermoset membranes are compounded from synthetic rubber polymers, and the most commonly used polymers are EPDM, CSPE, and Neoprene. They’re ideal for larger roofing projects. On the other hand, thermoplastic single-ply membranes can be hot-air welded together to form cohesive laps. Two of the most commonly used thermoplastic single-ply membranes are PVC and TPO. Thermoplastic membranes are usually manufactured to include a reinforcement layer that provides additional strength and stability. Both types of membrane are highly flexible, resistant to ultraviolet radiation, and relatively easy to install! What is a metal roof system? A metal roof is made from metal pieces or tiles commonly made of copper, zinc, or steel alloys. These roofs are characterized by their high resistance, impermeability and longevity. These roofs are great for your commercial project as they can last up to 100 years as they’re super resistant to common problems like as eroding, shrinking or cracking. You’ll find that due to their longevity, most metal roofs are less expensive than asphalt shingles in the long term. Does your company have a stay green initiative? Go for a metal roof! Metal roofs often consist of a high percentage of recycled material and is 100% recyclable. They also help lower energy costs as they reflect UV rays and keep the structure cool. Metal roofs don’t get as hot as asphalt roofs which makes them perfect in the hot Arizona sun! Metal roofing is super lightweight, comes with endless possibilities in terms of design, and can even be installed on top of an existing roof. Despite how lightweight this roof is, metal roofing has increased wind resistance compared to other roofing materials. This is most metal roof systems employ interlocking panels. Roof Coating Systems are monolithic membranes that are spray applied across your roof, around pipes, hatches, and other equipment found on the roof top to fully seal and waterproof your roof. Roof coatings are applied directly on top of your existing roof, speeding up installation time and reducing costs.And because you can apply them directly on your existing roof, you don’t need to worry about getting a completely new roof or finding a way to dispose of the old roof. What makes it even better is that these systems are extremely renewable! These systems can even be re-coated every 10+ years to lengthen the roof-life, renew the reflectivity, and ensure excellent waterproofing capabilities. Highly reflective top coats provide excellent UV protection to your rooftop. This additional protection adds years to your roof and reduces roof maintenance costs. Highly reflective roof coatings also deliver a cooler and more comfortable environment inside the building with less air conditioning usage, ultimately lowering your energy utility costs. Worried about installation? A huge cost advantage to both the AcryPly and ARM systems are they do not require a business to close during installation. The systems create minimal noise allowing you to conduct business as usual with less disruption to the occupants inside the building. Many people think of spray foam roofing as a new invention, but that is simply not true! Spray Polyurethane Foam (SPF) has been used as a roofing and insulation material for over 40 years. Foam roofing systems are super durable, affordable, and great for the environment. Foam roofing systems provide many benefits including waterproofing, insulation value, superior strength, lightweight, durability, uplift wind resistance, seam-free barrier against the elements and longevity. Once the SPF has been applied to the proper thickness and finish specifications, a protective layer of elastomeric coating is applied. This protective layer produces a durable weather resistant surface and that can be walked on for normal maintenance. Another great benefit of Polyurethane Foam Roofing system are great energy savings on both cooling and heating costs. People have reported savings as much as 50% on monthly energy bills. Studies performed by Texas A&M on their own roofs show the energy cost reduction obtained by applying Spray Polyurethane Foam (SPF) Roofing paid for the cost of the roofing in a little over three years. Spray polyurethane foam is one of the most effective and relatively inexpensive roofing system to install, and provides the benefits of energy efficiency to help pay back the cost of the re-roofing you already need. Waterproofing System seals every roof entry point, including seams, fasteners, flashings, penetrations, and skylights to ensure that water will not get into the building. The waterproofing system can be applied on its own or can be applied prior to the application of a different roofing system. To ensure the longevity of your waterproof roof, our waterproof system can be touched up to bring it back to full integrity. But what about wall coating? Superior quality, extreme weatherability, and durability are just a few characteristics that come to mind when considering high-performance coatings. Wall Coatings provide a protective barrier that shields the underlying wall surface from the harshest weather. The coatings also have the ability to hide surface imperfections, unattractive colors, and textures. Wall coatings provide a highly weather resistant membrane to external walls and allow the walls of your property to breathe whilst still remaining water resistant. Highly developed coatings and primers ensure long-lasting adhesion and they’re designed to last for up to 25 years and will outlast paint by many times. The extraordinary benefits of a concrete tile roof, including its proven durability, sustainability and beauty, do not have to be limited to residential structures. Commercial structures with roof pitches can reap these benefits as well! Just like the roof on a home, the roof on a commercial structure is the first line of defense from the hazardous outside elements. Concrete tile roofs can withstand the harshest of these elements including wind gusts of up to 180 mph, damage from hail stones up to 2”, freeze/thaw climates and fires. There are also added advantages when it comes to energy savings when using tile roofing. The inherent reflective properties of the tiles results in a 48 percent reduction in heat transfer by reflecting sunlight and, instead of absorbing that heat and transferring it down from the roof deck and into the structure, the tiles actually release that heat. This means the inside of the building will stay cool in the hot Arizona sun. curb appeal that is not available with other roofing options.